Want to be notified of new releases in egonSchiele/og-equity-compensation? Pull request Compare This branch is 14 commits behind jlevy:master. It is a confusing topic that is often not discussed clearly. This is unfortunate because it makes it harder to make good decisions. Many people learn the basic ideas through experience or reading, but equity compensation is a complicated and difficult area usually only thoroughly understood by professionals. Sadly, both companies and employees are routinely hurt by costly mistakes which might otherwise be avoided. This guide aims to improve that situation. It does not presume you have a law degree or MBA. The material is dense, but we endeavor to present it in a way that is understandable to lawyers and non-lawyers alike. Think of the Guide as a small book, not a blog. We suggest you star and refer to it in the future. An hour or two reading the material here and the linked resources could ultimately be among the most financially valuable ways you could spend that time. This document and the discussion around it are not legal or tax advice. Talk to a professional if you need advice about your particular situation. See the full disclaimer below. If you’re thinking of working for a company that is offering you equity, it is critical to understand both the basics and some very technical details about the exact type of compensation you are being offered, including the tax consequences. Equity compensation and tax might seem like different topics, but they are so intertwined it's hard to explain one without the other. An understanding of the underlying rules is necessary for negotiating fair offers—on both sides. Of course, this Guide can’t replace professional advice. But talk to anyone who’s worked in startups and they’ll have stories of how they or their colleagues made costly mistakes as a result of not understanding these details. Assessing the advice you receive from your personal or company attorney can be easier when you have all the information to work with. This Guide applies to C corporations in the United States. It's geared towards employees, advisors, and independent contractors who want to know how stock and stock options in C corps work. This includes most startups. Typically startups and major companies are C corps, and not LLCs or S corporations. LLC equity compensation is different and not covered in this Guide (yet). This content should also be useful for founders or hiring managers who need to talk about equity compensation with employees or potential hires. Our aim is to be as helpful to the absolute beginner as it is for those with more experience. Anyone curious to learn about these topics will be able to navigate this Guide. We keep this brief, so you can skim and return to it easily. Sections are organized into individual points, so it’s easier to read, refer back to, contribute to, and correct. We link liberally, so we can define terms, include curated articles that have a lot more detail, and give credit where it is due. Why an Open Guide? Why on GitHub? This is an open Guide. It’s open to contributions, so, unlike a blog, it is living, and can be improved. While a lot of information on this topic is just a Google search away, it is scattered about. Many blogs and articles focus only on a narrow topic, are getting older, or are on sites supported by ads or other products. It should be possible to assemble this information sensibly, for free. This document was started by Joshua Levy and Joe Wallin. It’s a preliminary version, and no doubt has some errors and shortcomings, but we want to see it evolve. If you have an idea or contribution that might improve this Guide, please file issues or PRs. Questions are also welcome (as issues), as they help us next time we revise the guide. We gladly credit all contributors. This section covers the fundamental concepts and terminology around stock, stock options, and equity compensation. Your compensation is everything you get for working for a company. When you negotiate compensation with a company, the elements to think about are cash (salary and bonus), benefits (health insurance, retirement, perks), and equity (what we discuss here). (ii) Equity compensation for limited liability companies is dramatically different from equity compensation in corporations. Equity compensation is commonly used for founders, executives, employees, contractors, advisors, directors, and others. To align individuals' incentives with the interests of the company. Equity compensation generally consists of stock, stock options, or restricted stock units (RSUs) in the company. We’ll define these concepts next. Stock represents ownership of the company, and is measured in shares. Founders, investors, employees, board members, contractors, advisors, and others may all have stock. Stock in private companies frequently cannot be sold and may need to be held indefinitely, or at least until the company is sold. In public companies, people can buy and sell stock on exchanges, but in private companies like startups, usually you can’t buy and sell stock easily. Public and some private companies can pay dividends to shareholders, but this is not common among technology startups. The total number of outstanding shares reflects how many shares are currently held by all shareholders. This number starts at an essentially arbitrary value (such as 10 million) and thereafter will increase as new shares are issued. It may increase or decrease for other reasons, too, such as stock splits and share buy back. If you have stock, what ultimately determines its value is percentage ownership of the entire company, not the absolute number of shares. To determine the percentage of the company a certain number of shares represents, divide it by the number of outstanding shares. Private companies always have what is referred to as “authorized but unissued” shares. For example, a corporation might have 100 million authorized shares, but will only have actually issued 10 million shares. In this example, the corporation would have 90 million authorized but unissued shares. When you are trying to determine what percentage a number of shares represents, you do not make reference to the authorized but unissued shares. “Issued and outstanding” refers to the number of shares actually issued by the company to shareholders. Note this will not include shares that others may have an option to purchase. Generally, it’s best to know the fully diluted number to know the likely percentage a number of shares is worth in the future. The terminology mentioned here isn’t universally applied, either, so it’s worth discussing it to be sure there is no miscommunication. What is your stock worth? It is hard to value private company stock. A stock certificate is a piece of paper that entitles you to something of highly uncertain value, and could well be worthless in the future, or highly valuable, depending on the fate of the company. 🔸 Generally, selling stock in a private company may be difficult, as the company is not listed on exchanges, and in any case, there may be restrictions on the stock imposed by the company. In startups, it is typical to hold the stock until the company is sold or becomes public in an IPO. A sale or IPO is often called an exit. Sales, dissolutions, and bankruptcy are sometimes called liquidations. 🔹 Private sales: In a few cases, you may be able to sell private company stock to another private party, such as an accredited investor who wants to become an investor in the company, but this is fairly rare. This is often called the secondary market. Sales generally require the agreement and cooperation of the company. For example, typically your shares would be subject to a right of first refusal in favor of the company (meaning you couldn’t sell your shares to a third party without offering to sell it to the company first). Another possible roadblock is that private buyers may want the company's internal financials to establish the value of the stock, and this typically requires the cooperation of the company. There have been some efforts such as SharesPost, Equidate, and EquityZen to establish a market around such sales, particularly for well-known pre-IPO companies, but it’s still not a routine practice. Quora has more discussion on this topic. Stock comes in two main types, common stock and preferred stock. You’ll also hear the term founders’ stock, which is (usually) common stock allocated at a company’s formation. It’s complicated, but in general preferred stock is stock that has rights, preferences, and privileges that common stock does not have. For example, preferred stock usually has a liquidation preference, which gives the preferred stock owner the right to be paid before the common stock owners upon liquidation. Liquidation overhang refers to how much liquidation preference is ahead of the common stock. For example, if the company has received hundreds of millions of dollars in investments from investors, the common stock will not be worth anything on a sale unless the sale price exceeds the liquidation overhang. Generally employees and service providers receive common stock or options to purchase common stock in return for their service, and investors receive preferred stock. Stock options (called “employee stock options” when given to employees) are contracts that allow you to buy shares. When you buy shares, it's called exercising the options. Options are not the same as stock; they are only the right to buy stock upon and subject to the conditions specified in the option agreement. Stock options allow you to buy shares at a fixed price per share, the strike price. The strike price is generally set lower (often much lower) than what people expect will be the future value of the stock, which means you can make money when you sell the stock. Options expire. You need to know how long the exercise window will be open. Options are only exercisable for a fixed period of time, typically seven to ten years as long as you are working for the company. ❗ Importantly, options can expire after you quit working for the company. Often the expiration is 90 days after termination of service, making the options effectively worthless if you cannot exercise before that point. 🔹 Recently (since around 2015) a few companies are finding ways to keep the exercise window open for years after leaving a company, and promote this as fairer to employees. See this list, which includes Amplitude, Clef, Coinbase, Pinterest, and Quora. 🔸 Vesting: Stock and stock options may be granted to you, but they come with a variety of conditions and limitations. One of the most significant conditions is that you usually “earn” rights to the shares or options over time or under certain events. This is called vesting. Vesting usually occurs according to a vesting schedule. You vest only while you work for the company. For example, it is very common to have stock or options vest over a period of four years, a bit at a time, where none of it is vested at first, and all of it is vested after four years. Vesting schedules can also have a cliff, where until you work for a given amount of time, you are 0% vested. For example, if your equity award had a one-year cliff and you only worked for the company for 11 months, you would not get anything, since you have not vested in any part of your award. Similarly, if the company is sold within a year, depending on what your paperwork says, you may also receive nothing on the sale of the company. A very common vesting schedule is vesting over 4 years, with a 1 year cliff. This means you get 0% vesting for the first 12 months, 25% vesting at the 12th month, and 1/48th (2.08%) more vesting each month until the 48th month. For example, if you leave just before a year is up, you get nothing, but if you leave after 3 years, you get 75%. Vesting might also occur in certain situations. You may have acceleration, where vesting is triggered if a company is sold (single trigger) or if it’s sold and you’re fired (double trigger). This is common for founders and not so common for employees. Grants for advisors typically vest over a shorter period than employee grants, often two years. Advisor grants also typically have a longer exercise window post termination of service. Typical terms for advisors, including equity levels, are available from the 📥 Founder Institute’s Founder/Advisor Standard Template (FAST). Restricted stock units (RSUs) refer to an agreement by the company to issue you shares of stock or the cash value of shares of stock on a future date. Each unit represents one share of stock or the cash value of one share of stock that you will receive in the future. The date on which you receive the shares or cash payment is the settlement date. 🔸 RSUs may vest according to a vesting schedule. The settlement date may be the time-based vesting date or a later date based on, for instance, the date of a company's IPO. Both options and RSUs are common forms of equity compensation, with RSUs more common for larger companies and options more common for startups. RSUs are difficult in a startup or early stage company because when the RSUs vest, the value of the shares might be significant, and taxes will be owed on the receipt of the shares. This is not a bad result when the company has sufficient capital to help the employee make the tax payments, or the company is a public company that has put in place a program for selling shares to pay the taxes. But for cash-strapped private startups, neither of these are possibilities. This is the reason most startups use stock options rather than RSUs, stock bonuses, or stock awards. RSUs are often considered less preferable to grantees since they remove control over when you owe tax. Options, if granted with an exercise price equal to the fair market value of the stock, are not taxed until exercise, an event under the control of the optionee. If a company awards you an RSU or restricted stock award which vests over time, you will be taxed on the vesting schedule. You have been put on “autopilot” with respect to the timing of the tax event. This can be a really bad thing if, on the date of vesting, the shares are worth a lot and consequently you owe a lot of tax. ☝️ You don't want to confuse “restricted stock units” with “restricted stock,” an entirely different thing (described next). These are a few different types of equity awards and topics that are less common, but we mention for completeness. A phantom stock award entitles you to a payment equal to the value of a share of the company's stock, upon the occurrence of certain events. Stock appreciation rights (SAR) give the recipient the right to receive a payment calculated by reference to the appreciation in the equity of the company. Warrants are another kind of option to purchase stock, generally used in investment transactions (for example, in a convertible note offering, investors may also get a warrant; or a law firm may ask for one in exchange for vendor financing). As an employee or advisor, you may not encounter warrants, but it’s worth knowing they exist. They differ from stock options in that they are more abbreviated and stand-alone legal documents, not granted pursuant to a “plan.” Also, because they are usually used in the investment context, they do not typically include service-based vesting provisions or termination at end of service, and are valid for a set number of years (often, 10 years). Now for the details around how stock and options are used for compensation. Companies can give equity compensation as stock awards, stock options, or RSUs. While the intent of each is similar, they differ in many ways, particularly around taxation. RSUs generally don’t make sense for early stage companies. If companies do grant stock, it may be restricted stock. In this context, “restricted” refers to the fact that the stock will be subject to repurchase at a lower rate than fair market value or cost, and the repurchase right lapses over the service-based vesting period. Typically, stock awards are limited to executives or very early hires, since once the value of the shares increases, the tax burden of receiving them can be too great for most people. Instead, it’s more common for employees to get stock options. 🔹 At some point early on, generally before the first employees are hired, stock will be allocated to a stock option pool. A typical size for this is 20% of the stock of the company, but it can be 10%, 15%, or other sizes. Once the pool is established, then the company's board of directors grants pieces of it to employees as they join the company. Often, the whole pool is never used. The size of the pool is not just about how generous the company is with employees; it is determined by complex factors between founders and investors. ISOs are common for employees because they have the possibility of being more favorable from a tax point of view than NSOs. They can only be granted to employees (not independent contractors or directors who are not also employees). But ISOs have a number of limitations and conditions and can also create difficult tax consequences. More on this below. 🔹 Sometimes, to help you lower your tax burden, the company makes it possible to early exercise (or forward exercise) stock options. This means you exercise them even before they vest: you exercise them and you become a stockholder, but the company has the right to repurchase the unvested shares (at lower the price you paid or the fair market value of the shares) if you quit working for the company. The company will typically repurchase the unvested shares should you leave the company before the stock you’ve purchased vests. 🔸 Stock options will expire after you leave a company (typically after 90 days). You might early exercise, or exercise at different times during your employment, depending on how much it costs and what the tax implications are. More on this below. Companies may impose additional restrictions on stock that is vested. For example, your shares are very likely subject to a right of first refusal. And it can happen that companies reserve the right to repurchase vested shares in certain events. Equity compensation awards can give rise to federal and state income taxes as well as employment taxes and Medicare surtax charges. We’ll first back up and discuss fundamentals of how different kinds of taxes are calculated. You must pay federal, state, and in some cases, local taxes on income. State tax rates and rules vary significantly state to state. Since federal rates are much higher than state rates, you usually think of federal tax planning first. Employment taxes: Social Security and Medicare taxes that are withheld from your paycheck. The Social Security wage withholding rate is 6.2% up to the FICA wage base. The Hospital Insurance component is 1.45%, and it does not phase out above the FICA wage base. Long-term capital gains tax: Taxes on investment gains that are “long-term” are taxed at a lower rate than ordinary income. Alternative Minimum Tax (AMT): An entirely different kind of tax that has separate rules and only applies in some situations. Ordinary income tax applies in the situations you’re probably already familiar with, where you pay taxes on salaries or wages. Tax rates are based on filing status (if you are single, married, or support a family), and on which income bracket you fall under. 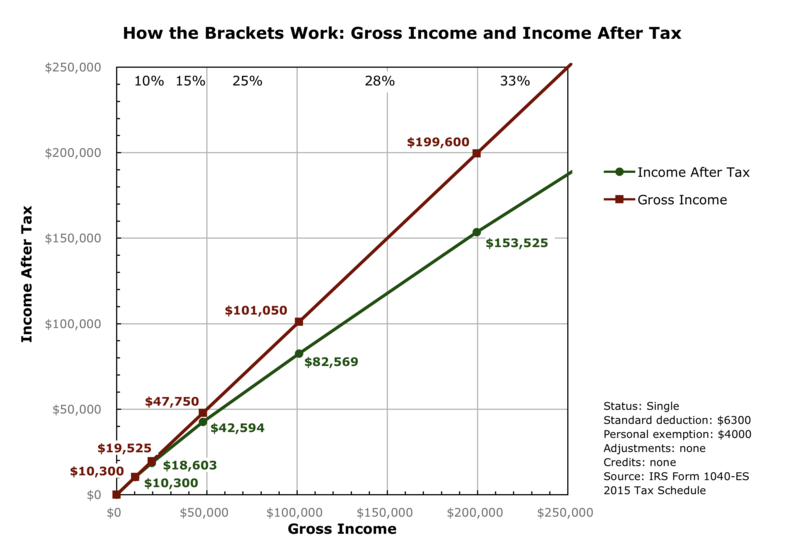 As of the 2018 tax year, there are income brackets at 10%, 12%, 22%, 24%, 32%, 35%, and 37% marginal tax rates — see Notice 1036. Be sure you understand how these brackets work, and what bracket you’re likely to be in. ☝️ There is sometimes a misconception that if you move to a higher bracket, you’ll make less money. What actually happens is when you cross certain thresholds, each additional (marginal) dollar money you make is taxed at a higher rate, equal to the bracket you’re in. It looks roughly like this (source). Investment gains, such as buying and selling a stock, are similarly taxed at “ordinary” rates, unless they are long-term, which means you held the asset for more than a year. Ordinary federal income tax, Social Security, and Medicare taxes are withheld from your paycheck by your employer and are called employment taxes. 🔹 Long-term capital gains are taxed at a lower rate than ordinary income tax: 0%, 15%, or 20%. This covers cases where you get dividends or sell stock after holding it a year. If you are in the middle brackets (more than about $37K and less than $413K of ordinary income), your long-term capital gains rate is 15% (more details). State long-term capital gains rates vary widely. California has the highest, at 13.3%, while other states have none. For this reason, some people even consider moving to another state if they are likely to have a windfall gain, like selling a lot of stock after an IPO. Alternative Minimum Tax (AMT) is a complex part of the federal tax code many taxpayers never worry about. Generally, you do not pay unless you have high income (>$250K) or high deductions. It also depends on the state you’re in, since your state taxes can significantly affect your deductions. Confusingly, if you are affected, AMT tax rates are usually at 26% or 28% marginal tax rate, but effectively is 35% for some ranges, meaning it is higher than ordinary income tax for some incomes and lower for others. AMT rules are so complicated you often need professional tax help if they might apply to you. The IRS’s AMT Assistant might also help. ❗ AMT is important to understand because exercising incentive stock options can trigger AMT. In some cases a lot of AMT, even when you haven’t sold the stock and have no money to pay. More on this below. 🔹 Section 1202 of the Internal Revenue Code provides a special tax break for qualified small business stock held for more than five years. Currently, this tax break is a 100% exclusion from income for up to $10M in gain. There are also special rules that enable you to rollover gain on qualified small business stock you have held for less than five years. Stock received on the exercise of options can qualify for the Section 1202 stock benefit. Now we’ve covered the basic concepts of equity and taxes, here are some messy details of how they interact. As already discussed, employees can get restricted stock, stock options, or RSUs. The tax consequences for each of these is dramatically different. Generally, restricted stock is taxed when it vests as ordinary income. Of course, if the stock is in a startup with low value, this may not result in very much tax being owed. But if it's been years since the stock was first granted and the company is now worth a lot, the taxes owed could be significant. 🔹 However, the Internal Revenue Code offers an alternative, called a Section 83(b) election, which is an election to be taxed on the receipt of the property, even though you might not get to keep it since it has not vested. The presumption of the tax law would normally be that you do not owe tax until property you have received vests. With a Section 83(b) election, you’re telling the IRS you want to pay taxes early, on stock that is not yet vested, instead of paying as it vests. The election can potentially reduce your tax significantly: If the shares go up in value, the taxes owed on vesting might be far greater than the taxes owed at the time of receipt. An 83(b) election isn’t guaranteed to reduce your taxes, of course. For example, the value of the stock may not increase. And if you leave the company before you vest, you don't get the taxes you’ve paid back. ❗ You must file the 83(b) election yourself with the IRS within 30 days of the grant or exercise, or the opportunity is irrevocably lost. 🔸 Section 83(b) elections cannot be made on the receipt of a stock option. They can only be made on the receipt of actual shares of stock. If you receive an immediately exercisable stock option (meaning, an option that is early exercisable, when it is not vested), and you exercise the option before the option vests, you can make an 83(b) election on your receipt of the shares on exercise. Section 83(b) elections do not apply to vested shares; the election only applies to stock that is not yet vested. Thus, if you receive options that are not early exercisable, which you cannot exercise until vested, then an 83(b) election would not apply. 🔹 Founders and very early employees will almost always want to do an 83(b) election upon the receipt of unvested shares, since the stock value is probably low. If the value is really low, and the taxes owed are not that great, you can make the election without having to pay much tax and start your capital gains holding period on the shares. When stock vests, or you exercise an option, the IRS will consider what the fair market value (FMV) of the stock is when determining the tax you owe. Of course, if no one is buying and selling stock, as is the case in most startups, then its value isn’t obvious. For the IRS to evaluate how much stock is worth, it uses what is known as the 409A valuation of the company. The startup pays for an appraisal that sets the 409A, typically annually or after events like fundraising. In practice, this number could be low or high. 🔹 A company wants the 409A to be low, so that employees make more off options, but not low enough the IRS won’t consider it reasonable. Typically, the 409A is much less than what investors pay for preferred stock; often, it might be only a third of the preferred stock price. Startups generally decide to give ISOs or NSOs depending on the legal advice they get. It’s rarely up to you which you get, so you need to know about both. There are pros and cons of each from both the recipient’s and the company’s perspective. 🔸 ISOs cannot be granted to non-employees (i.e., independent contractors). ❗🔹 When you owe tax: When you get stock options and are considering if and when to exercise them, you need to think about the taxes. In principle, you need to think about taxes (1) at time of grant; (2) at time of exercise; and (3) at time of sale. 🔹 If you are granted ISOs or NSOs at a low strike price, and the bargain element is zero, then you may be able to exercise at a reasonable price without triggering taxes at all. So assuming the company allows it, it makes sense to early exercise immediately (buying most or all of the shares, even though they’re not vested yet) and simultaneously file an 83(b) election. 🔸☝️ Section 83(b) elections are elections to be taxed on the receipt of property even though you might have to forfeit or give back the property to the company. You can make an election on the receipt of stock, but you cannot make the election on the receipt of an option or an RSU because options and RSUs are not considered property for purposes of Section 83(b). 🔸🌪 ISOs are often preferred by startups, as they're supposedly better for employees from a tax perspective. This assumes that (1) AMT won’t be triggered and (2) you’ll get low long-term capital gains rate by holding the stock for the appropriate holding periods. However, often you either run afoul of the AMT trap, or don’t hold the stock long enough with the complicated 1 year + 2 year requirement, or the spread at exercise is small or zero, so the difference wouldn’t matter anyway. NSOs do have a slightly higher tax because of the employment taxes. Overall, it’s not clear the ISO is that much better for employees, so many people argue for NSOs instead. 🔸☝️ Even more confusingly, ISOs can make it harder to meet the long-term capital gains holding period. Many people expect early exercise together with an 83(b) election will help them hold the stock longer, to qualify for long-term capital gains. While this is true for NSOs, there is a murky part of the rules on ISOs that implies that even with an 83(b) election, the capital gains holding period does not begin until the shares actually vest. So, if you want to immediately exercise an option and file a Section 83(b) election, and you might have liquidity soon, it’s better if you can have it be an NSO. If you are awarded RSUs, each unit represents one share of stock that you will be given when the units vest. 🔸 When you receive your shares, you are taxed on their value at that time. If you are an employee, this means you may have to write a check to the company to cover your income and employment tax withholding. Often, for U.S. employees, companies will withhold the tax in the form of shares such that no action is required by the employee at vesting time. If you receive an RSU when the stock is of little value, you cannot elect to be taxed on the value of that stock when you receive the RSU—you pay taxes at vesting time, based on the value of the shares at that time. You will owe tax when you receive the shares, even though they are illiquid. You can't minimize the impact of an increase in value of the underlying shares between the date you receive the RSU and the date it is settled. If you are an employee you will have to write a check to the company to satisfy your income and employment tax withholding. 🔸 RSUs are less attractive than options from a tax point of view because you cannot make an 83(b) election with respect to an RSU. By contrast, if you receive a stock option, as long as it is priced at fair market value, you will have no income upon receipt of the options, and your income tax and employment tax consequences will be deferred until you exercise, an event under your control for the most part. This section is a primer on how companies raise funding and grow, as this is critical to understanding the value of a company and what equity in a company is worth. Bootstrapped: No funding. Founders are figuring out what to build, or they're starting to build with their own time and resources. Series Seed ($250K to $2 million): Figuring out the product and market. Series A ($2 to $15 million): Scaling the product and making the business model work. Series B (tens of millions): Scaling the business. Series C, D, E, etc. (tens to hundreds of millions): Continued scaling of the business. 🔸 Most startups don’t get far. Very roughly, if you look at angel investments, more than half of investments fail, one in 3 are small successes (1X to 5X returns), one in 8 are big successes (5X to 30x), and one in 20 are huge successes (30X+). 🔹 It is critical to understand risk and dilution to know the possible future value of equity. This article from Leo Polovets, a partner at Susa Ventures, gives a good overview. How much money has the company raised (including in how many rounds, and when)? What did the last round value the company at? Will the company likely raise more capital soon? What is the revenue now, if any? What are the revenue goals/projections? Where do you see this company in 1 year and 5 years? Revenue? Employees? Market position? It takes quite a bit of know-how to be able discuss, understand, and evaluate equity compensation offers. If you don’t yet have an offer, see the sections below on evaluating a company and negotiation. Stock value: Determined by the value the company will have in the future, and the number of shares you own. Vesting and liquidity: When you will actually will the shares and when you’ll be able to sell them. Tax: Both the purchase and the sale of stock can require that you pay taxes—sometimes very large amounts. There are several kinds of taxes that apply when you have stock: income, capital gains, and AMT. 🔹 Percentage: Knowing how many shares of stock or stock options you have is meaningless unless you know the number of outstanding shares. What matters is the percentage of the company the shares represent. Typically, this number is presented in percent or basis points (hundredths of a percent). Some companies don’t volunteer this information unless you specifically ask, but it’s always a fair question, since without it, the offer of shares is almost meaningless. You need to understand the type of stock grant or stock option in detail, and what it means for your taxes, to know the likely value. In some cases, high taxes may prevent you from exercising your options, and if you can’t sell the stock, you could effectively be forced to walk away from it if you can't afford to exercise. What percentage of the company do the shares represent? What set of shares was used to compute that percentage (is this really the percentage of all shares, or some subset)? What did the last round value the company at? (I.e. the preferred share price times the total outstanding shares)? What is the most recent 409A valuation? When was it done, and will it be done again soon? Do you allow early exercise of my options? Are all employees on the same vesting schedule? Is there any acceleration of my vesting if the company is acquired? Do you have a policy regarding follow-on stock grants? Does the company have any repurchase right to vested shares? Finally, consider the common scenarios for exercising options, discussed below. If you don’t yet have an offer, it’s important to negotiate firmly and fairly to get a good one. A Guide like this can’t give you personal advice on what a reasonable offer is, as that depends greatly on your skills, the marketplace of candidates, what other offers you have, what the company can pay, what other candidates the company has found, and the company’s needs. However, this section covers some basics of what to expect with offers, and tips on negotiating an offer. 🔹 Most companies, especially well-established ones, give roughly equal treatment to candidates. But even so, sophisticated negotiators can often get better offers. Many companies will give some flexibility during negotiations, letting you indicate whether you prefer higher salary or higher equity. Candidates with competing offers almost always have more leverage and get better offers. Salaries at startups are often a bit below what you’d get at an established company, since early on, cash is at a premium. For very early stage startups, risk is higher, offers can be more highly variable, and variation among companies will be greater, particularly when it comes to equity. The dominant factors determining equity are what funding stage a company is at, and the role you'll play at the company. If no funding has been raised, large equity may be needed to get early team members to work for very little or for free. Once significant funding of an A round is in place, most people will take typical or moderately discounted salaries. Startups with seed funding lie somewhere in between. 🔹🌪 There are no hard and fast rules, but for post-series A startups in Silicon Valley, this table, based on the one by Babak Nivi, gives ballpark equity levels that many think are reasonable. These would usually be for restricted stock or stock options with a standard 4-year vesting schedule. They apply if each of these roles were hired just after an A round and are also being paid a salary (so are not founders or employees hired before the A round). The upper ranges would be for highly desired candidates with strong track records. For post-series B startups, equity numbers would be much lower. How much lower will depend significantly on the size of the team and the company's valuation. Seed-funded startups would offer higher equity—sometimes much higher if there is little funding. 🔹 One of the best ways to tell what is reasonable for a given company and candidate is to look at offers from companies with similar profiles on AngelList. Keep in mind much of the above information is heavily biased toward early-stage Silicon Valley tech startups, not companies as a whole across the country. Companies will always ask you what you want for compensation. And you should always be cautious about answering. If you name a number that you’ll accept, you can be fairly sure the company won’t exceed it, at least not by much. - Some argue that a good tactic in negotiating is to start higher than you will be willing to accept, so that the other party can “win” by negotiating you down a little bit. Keep in mind, this is just a suggested tactic by some, and not a hard and fast rule. If you are inexperienced and are unsure what a fair offer should look like, avoid saying exactly what you want for compensation very early in discussions. It’s common for hiring managers or recruiters to ask this early in the process, just to take advantage of candidates that don’t have a good sense of their own worth. Tell them you want to focus on the opportunity as a whole and your ability to contribute before discussing numbers. Ask them to give you a fair offer once they understand your worth to the company. If you are experienced and know your value, it’s often in your interest to state what sort of compensation and role you are looking for to anchor expectations. You might even share your expectations early in the process, so you don’t waste each other’s time. Discuss what your compensation might be like in the future. No one can promise you future equity, salary, or bonuses, but it should be possible to agree what they will look like if you've demonstrated outstanding performance and the company has money. If you’re coming from an established company to a startup, you may be asked to take a salary cut. This is reasonable, but it’s wise to discuss explicitly how much it is, and when that will be changed up front. For example, you might take 25% below your previous salary, but there can be an agreement that this will be corrected if your performance is strong and the company gets funding. 🔹 Always negotiate non-compensation aspects before agreeing to an offer. If you want a specific role, title, opportunity, visa sponsorship, special treatment (like working from home), or have timing constraints about when you can join, negotiate these early, not late in the process. ❗ Get all agreements in writing, if they are not in your offer letter. 🔹 If you’re going to be a very early employee, consider asking for a restricted stock grant instead of stock options, and a cash bonus equal to the tax on those options. This costs the company a little extra paperwork (and legal costs), but means you won’t have to pay to exercise. Then, if you file an 83(b) election, you’re simplifying your situation, eliminating the AMT issues of ISOs, and maximizing your chances of qualifying for long-term capital gains tax. Getting multiple offers is always in your interest. If you have competing offers, sharing the competing offers with the company you want to work for can be helpful, granted your offers are competitive. However, dragging out negotiations excessively so you can “shop around” an offer to other companies is considered bad form by some people, so it’s thoughtful to be judicious and timely to the extent that it's possible. Reneging on offers: Do not accept an offer verbally or in writing unless you’re ready to stand by your word. In practice, people do occasionally accept an offer and then go back on it, or renege. In the United States, this is considered a very bad thing to do, especially if it put the company in a difficult position (they may have declined another key candidate based on your acceptance), and may hurt your reputation in unexpected ways later. Robby Grossman, a VP at Wistia, gives a good overview of equity compensation and negotiation suggestions. Once you have stock options, there are several possible scenarios for exercise. After leaving the company, as long as the exercise window is open. 🔸 Recall that often the window closes soon after you leave a company, generally 90 days after termination. Wait until acquisition: If the company is acquired for a large multiple of the exercise price, you may then use your options to buy valuable stock. However, as discussed, your shares could be worth next to nothing unless the sale price exceeds the liquidation overhang, since preferred stock is paid out first. 🔸 Secondary market: As discussed above, in some cases it’s possible to exercise and sell the stock in a private company directly to a private party. But this generally requires some cooperation from the company and is not something you can always count on. Cashless exercise: In the event of an IPO, a broker can allow you to exercise all of your vested options and immediately sell a portion of them into the public market, removing the need for cash up front to exercise and pay taxes. 🔹 Note that some of these scenarios may require significant cash up front, so it makes sense to do the math early. If you are in a tight spot, where you may lose valuable options altogether because you don’t have the cash to exercise, it’s worth exploring each of the scenarios above, or combinations of them, such exercising and then selling a portion to pay taxes. In addition, there are a few funds or individual investors who may be able to front you the cash to exercise or pay taxes in return for an agreement to share profits. Author and programmer Alex MacCaw explores a few more [detailed scenarios] (http://blog.alexmaccaw.com/an-engineers-guide-to-stock-options#exercising). This section covers a few kinds of documents you’re likely to see. It’s not exhaustive, as titles and details vary. Your offer letter, which will detail salary, benefits, and equity compensation. An Employee Innovations Agreement, Proprietary Information and Inventions Assignment Agreement or similar, concerning intellectual property. 📥 You should receive a form 3921 or 3922 from your company if you exercised ISO options during the year. These are scenarios that can be very costly for you if you aren’t aware of them. ❗ Do not accept an offer of stock or shares without also asking for the exact number of total shares (or, equivalently, getting the exact percentage of the company those shares represent). It’s quite common for some companies to give offers of stock or options and tell you only the number of shares. Without the percentage, the number of shares is meaningless. Not telling you is a deeply unfair practice. A company that refuses to tell you even when you’re ready to sign an offer is likely giving you a very poor deal. 🔸 If you’re looking at an offer, work out whether you can and should early exercise, and what the cost to exercise and tax will be, before accepting the offer. ❗ If you join a company right as it raises a new round, and don’t have the chance to exercise right away, they may potentially issue you the options with the low strike price, but the 409A of the stock will have gone up. This means you won’t be able to early exercise without a large tax bill. In fact, it might not be financially feasible for you to exercise at all. 🔸 Vesting starts on a vesting commencement date. Sometimes stock option paperwork won’t reach you for months after you join a company, since it needs to be written by the lawyers and approved by the board of directors. This usually isn’t a big problem, but do discuss it to make sure the vesting commencement date will reflect the true start date of when you joined the company, not when the stock option is granted. 🔸 If you’re going to early exercise, consider it like any investment. Don’t believe every projection about the value of the company you hear. Founders will tell you the best-case scenario. Remember, most startups fail. Do your research and ask others’ opinions about likely outcomes for the company. ❗ It may not be common, but some companies retain a right to repurchase (buy back) vested shares. It’s simple enough to ask, “Does the company have any repurchase right to vested shares?” (Note repurchasing unvested shares that were purchased via early exercise is different, and helps you.) If you don't want to ask, the fair market value repurchase right should be included in the documents you are being asked to sign or acknowledge that you have read and understood. (Skype had a complex controversy related to repurchasing.) You might find a repurchase right for vested shares in the Stock Plan itself, the Stock Option Agreement, the Exercise Agreement, the bylaws, the certificate of incorporation, or any other stockholder agreement. Here are some common, costly errors to watch out for on the taxation side. ❗ One of the most serious tax-related mistakes you can make is to exercise ISOs without first knowing the impact on your AMT obligations. If there is a large spread between strike price and 409A value, you are potentially on the hook for a very large tax bill — even if you can’t sell the stock. This has pushed people into bankruptcy. It also caused Congress to grant a one-time forgiveness; the odds of that happening again are very low. Understand this topic and talk to a professional if you exercise ISOs. ❗ If you exercise your options, and your income had been from consulting rather than employment (1099, not W-2), you will be subject to the self-employment tax in addition to income tax. Self employment taxes consist of both the employer and the employee side of FICA. This means you will owe the Social Security tax component (6.2%) up to the FICA wage base, and you will owe the Hospital Insurance component (2.9%) on all of your income. 🔸 Thoughtfully decide when to exercise options. As discussed, if you wait until the company is doing really well, or when you are leaving, the delay can have serious downsides. Wealthfront, When Should You Exercise Your Stock Options? Wealthfront, How Do Stock Options and RSUs Differ? Mary Russell, Can the Company Take Back My Vested Shares? Accelerated Vesting, What Is An 83(b) Election and When Do I Make It? Many thanks to all contributors to this project. Thanks also to those who have given detailed feedback, including Julia Evans, George Grellas, Chris McCann, Leo Polovets, Srinath Sridhar, Andy Sparks and David Weekly and to many commentators on Hacker News. The original authors are Joshua Levy and Joe Wallin. This Guide and all associated comments and discussion do not constitute legal or tax advice in any respect. No reader should act or refrain from acting on the basis of any information presented herein without seeking the advice of counsel in the relevant jurisdiction. The author(s) expressly disclaim all liability in respect of any actions taken or not taken based on any contents of this guide or associated content.